Sniper Elite III is a celebration of extravagant carnage – and, less significantly, a big improvement over 2012′s Sniper Elite V2. Its predecessor’s stiff, linear gameplay has been swapped out for a more open-ended, creativity-enabling approach to stealth-shooting. But the big draw – the real draw – is the same pornographically violent X-ray-vision carnage that erupts whenever your bullets meet their targets. Unmatched flight physics that allow you to truly feel what it’s like to fly this legend. “Sniper Elite 3 is a tactical third-person shooter that combines stealth, gameplay choice and genre-defining ballistics with huge, open levels and the exotic terrain of World War 2 North Africa.” Here’s a new launch trailer that celebrates the news. Over the last few years we have seen ASRock gain movement in the motherboard arena. They have developed and revamped some rock solid motherboards at a very affordable price. In the past, we have seen many flagship motherboards from ASRock that have been top performers when it comes to overclocking and stability. Not only has ASRock performed well in the past, they have great aesthetic appeal too. Today, we have a chance to look at their newest variation from their already popular Fatal1ty series. 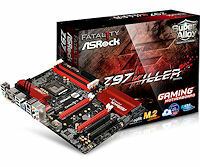 This is the ASRock Fatal1ty Z97 Killer Series Motherboard. With Haswell’s refresh chipset in full swing, we have tested a number of great performing motherboards. But today, the ASRock Fatal1ty Z97 Killer Series has another advantage in this arena due to its aggressive pricing. So let’s move forward and put this motherboard to the test and see what it can do with our Intel 4770K Haswell Processor. MSI‘s new GTX 780 Gaming 6 GB doubles the available video RAM over the reference design, which just has 3 GB. With the latest titles requiring 3 GB VRAM minimum for textures at Ultra, this 6 GB card could help provide a performance advantage. We will investigate this claim by using our brand-new VGA test suite. Advanced Warfare: Can Sci-fi Spectacle Replenish CoD’s Sheen? Call Of Duty: Advanced Warfare takes a cue from Black Ops 2 with its sci fi ordinance, except this time it isn’t just the guns the player wields that makes them feel like they’re soldiers from the future. The protagonist in this game is kitted out with an exo-skeleton – a steel frame clasping their limbs and spine that looks like the rig that Matt Damon was wearing in Elysium – that endows them with superhuman abilities. They’re faster, tougher and able to jump incredible heights and distances using something called the ‘boost’ mechanic. Some of the sci-fi weapons and equipment in Call of Duty: Advanced Warfare are on display in a new trailer from Sledgehammer’s upcoming futuristic installment in the military shooter series. The clip features Sledgehammer cofounders Glen Schofield and Michael Condrey describing how tech such as the exoskeleton redefine gameplay.